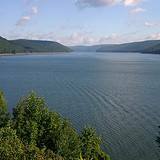 Visit the largest manmade lake east of the Mississippi, Raystown Lake in Huntingdon County, PA. KNOWN AS PENNSYLVANIA'S BEST KEPT SECRET! Pennsylvania camping couldn't possibly get any better than this. Enjoy the best of both worlds with modern conveniences, resort and lodge, restaurants, modern and rustic camping sites, modern marina, and waterslides. 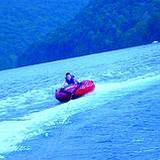 Raystown Lake is known as Pennsylvania's Crown Jewel. With 8300 miles of water, 118 miles of shoreline and 28 miles long. The dam itself is 225 feet high and 1700 feet long! 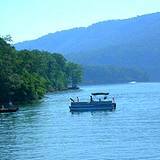 Raystown Lake is thought of as one of the many PA State Parks but it's actually owned and operated by the U.S. Army Corp of Engineers. It was opened in 1975 as a flood control project. Huntingdon County, PA is such a beautiful area to visit. It's full of rich Pennsylvania History that dates back to a tribe of people that lived in this region before the Native American Indians. Have you heard about Raystown Ray yet? It's a 50 to 60 foot creature that lives in Raystown lake. Read about the TV production company that's going to investigate it in April, 2010. Just driving along the road leading to Raystown Lake is breathtaking. While traveling down the road to Seven Points Marina if you stay on that road instead of turning into the Marina you'll come upon a Pennsylvania State Park called Trough Creek State Park. It's a strange little Pennsylvania State Park tucked away deep into the forest. If there weren't a sign there you'd drive right past it. It has so many nooks and cranny's to explore, including a swinging bridge, a rainbow waterfall and ice mine. What kind of family adventure are you looking for in Pennsylvania? Do you love camping or are you more the modern type and enjoy spending your vacation in a resort? Are you a fisherman? 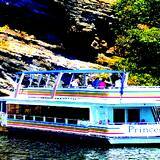 Or do you enjoy taking a cruise on the lake with music and dinner? What are you thoughts on spending you weekend on a houseboat? 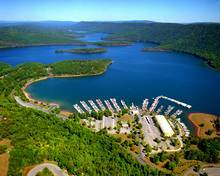 It don't matter what kind of family vacation you dream about, you'll find it at Raystown Lake. It isn't only the accommodations that keep thousands of visitors coming back year after year. You can enjoy just about any kind of recreation you enjoy too! This area is a golfers dream. Choose from beautiful country club golfing or an 18-hole golf course. Do you love horseback riding? There are enough stables and horseback riding trails to keep anybody that busy on a family vacation. Are you more inclined to spend your days on a motorboat or maybe drifting along on a pontoon boat fishing your day away? The region is a fisherman paradise. Have you ever been to a racetrack? Just a few miles away from Raystown Lake you'll find Hesston Speedway. Here you'll find an old fashioned dirt track for stock car racing. 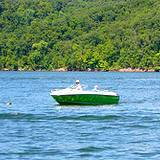 Go out on the lake, spend your day sunning on the sandy beech, rent a jet ski, or try a motor powered rubber boat. Hike through the forests or rent a bike. You'll be amazed at all the beautiful Pennsylvania Wildlife you'll see along the trails. Many of these trails are old Indian trails, many people find old Indian arrowheads. You'll find great restaurants, spas, water parks, and boats…lots and lots of boats. One of my family's favorite things to do on a hot summer evening is visit Raystown Lake and have our dinner. Then after dinner we love walking through the park watching the boats come in to dock. The kids love feeding the fish old bread and crackers we bring from home. You'll see thousands of fish just drifting along the shoreline to get a handout. Explore the beautiful valleys of the Susquehanna or travel through the Allegheny Mountains you'll discover historic Pennsylvania Attractions tucked away deep in the forests. When you visit Pennsylvania it's an adventure just travelling down the side roads.